1. This past year I have made some truly great friends through blogging and running. This network of pals is growing by the minute and I feel so BLESSED!!! I can hardly wait until June 25th to meet Bloggers near and far in Seattle!!! The EVITE to carbo night goes out this week. If you are running or spectating Seattle Rock N Roll and have not received info please email me. 2. Our youngest son is named after a place that my Dad took us growing up to find edible mushrooms and my Dad. Whenever we got to visit or drive past the sign it makes me smile. If we have another baby I would have to stick with the WA city names, since Little Stud #1 is also a WA city name....UGH! If it is a girl...hmmm Lacey is a pretty name?? 3. I love black and white photography, I spent hours in the dark room in college. I once took a photo of a bucket of baseballs... Before I took the photo I went up the the coach, my roommate's Dad, and said "Can I take a picture of your balls?" RED FACE!!! Yes I am that cool. Good news is my artsy prof loved the photo, as much as he did not want to. VICTORY for the humiliation. 4. My favorite distance is 10 miles. If I had time and could run 10 miles every day I would. Not sure what it is about double digits. Hmmmm....maybe it is time for a Tall Mom Ten Miler.... Takers? 5. I feel like I am VERY CLOSE to something big... Just have not figured out what that big thing is yet. But I hold hope that I will figure it out soon :) And when I do?? I will be sure to share. 6. I will not, should not, could not and do not watch scary, suspenseful, war, gore or horror movies. NO THANKS! Even the commercials freak me out. The closest thing to scary I watch is Ghost Whisperer...LOL.. and I have to watch that with the lights on an Muscle Man in close proximity. Yes I am a BIG scardy-cat! 7. I think everyone should own and wear bright colors shoes. I personally own bright pink and green and LOVE them. a cool pair of shoes can spice up an outfit and be fun. 1. Zoe- She is so funny and going to be a GREAT Mom! 5. Kerrie- I love how hard she tries! 1. Emily- This fasty ran 16 miles with me and planted the BQ confidence seed. 2. Aron- Her knowledge about training plans, fuel and race prep were AMAZING! 4. Jill- Free advice from a running coach. AWESOME I only wish we would have connected on my trip to colorado. 1. Marlene- I pick her up at the airport on 6/24!! And she is staying with us!! 2. Amanda- 26.2 with her at Rock N Roll! 3. TMB- She loves WA so she id bound to bring her awesome socks and skirts style to visit. 5. Stacie- Local blogger I have not met yet.. Soon!! My in-laws are in town for the day. I am hoping to get in a quick run. Then Sunday I will do my LONG RUN with my friend Corey who I have not seen in AGES!! Catching up with a friend and running new paths, AWESOME Sunday!! Love how you came up with the names! And I'd be in for a 10 miler. My husband grew up here in Lacey and his little sister's name is Lacey. So it works! I would totally be on board for a Tall Mom Ten Miler! After watching too many scary movies as a kid I learned that its not worth it. I have bad dreams for months and hate to get up to pee in the middle of the night! A 10 miler would be awesome! 10 is my favorite distance too. Its long enough to feel euphoric and mellow and not too far to have to recover for days! Wonderful list! I love that the kids' names were chosen for a reason. I love 10 miles too. That's what I run on my diuble days! So I am in for a Tall Mom 10 miler! And I'm right there with you on #6!!! Never have and never will! Can't wait to cheer everyone on at RNR! And the balls thing cracks me up! I love black and white pictures too! I haven't run ten miles in almost two years! Such a long time! I hate scary movies too! Hope you have a great weekend! Great list!! I love how you chose your kids names!! Enjoy the weekend!! Ten miles is my favorite distance too but it is so hard to find races with them. YAY! TMB is the BOMB, you will love her. And, I'm in for a 10 miler. You say when and I'll run it "with" you! I like 10 milers too, but I think it's a little too long for my favorite (for now at least). Ten miles just takes too long when there is SO much else to do!! Great list! On to something big? Hmm, can't wait to find out what it is. I love 10 miles... I wish we had more 10 miler races around here. I've only done one. I'd be in! Can't wait til June 24!!!!! Congrats on the bloggy award! I loved #4, pretty funny, and am totally with you on #6, too scary for me! Mel, your "Can I take a picture of yoru balls?" comment made me laugh out loud really hard. Now Levi keeps pestering me "Mom, why are you laughing?" "What's so funny?" He wont take NOTHING for an answer! I still can't stop laughing. I would give anything to have been there for that!!! Thanks for the tag!!!! You make me smile too!!! 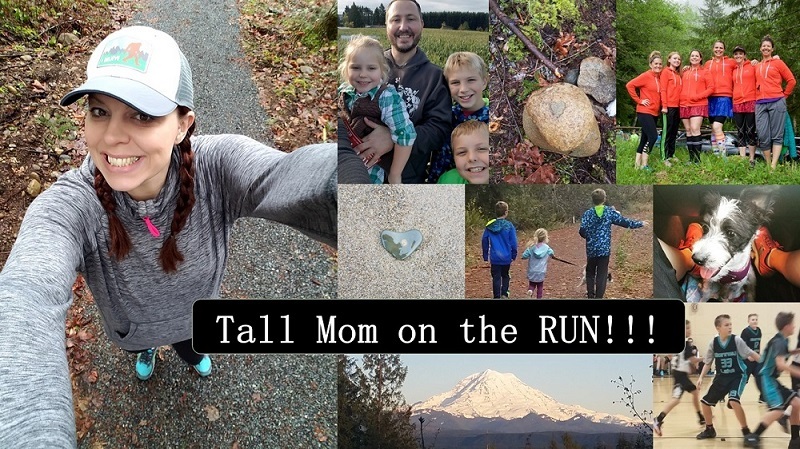 I'd love to do the Tall Mom Ten Miler. I'm in!!! Thanks for the tag. I'm working on it now :) Can't wait to meet everyone in June. I hate scary movies too!!! I will NOT even be in the same room while they are on! I hope you have a great week! YAY thank you for the tag :) i will post this week! SO with you on the scary/suspenseful...and even commercials - too funny! Bright colored shoes - both me and my hubby (he just got some green and yellow Oregon Nikes). And 10 milers are by FAR my fav! Awww, thanks! Why am I so behind on your blog? Did you just post this all at once? tee hee! You are a busy lady...I wonder what the "something" could be...keeping me on the edge of my seat!! !